Click here for info on the Cenobite Reunion at Monster-Mania 2012 along with Clive Barker, Clare Higgins, Ashley Laurence & Andy Robinson -- scheduled for this August, 2012 in Cherry Hill, NJ. The web site of Doug Bradley -- Pinhead from all the Hellraiser films. Writer & actor Nicholas played the Chatterer Cenobite in Hellraiser I & II. Actor, director & writer Simon played the Butterball Cenobite in Hellraiser I & II. Some of the best horror links & dark sites on the net, including writers, artists, filmmakers, actors & actresses. 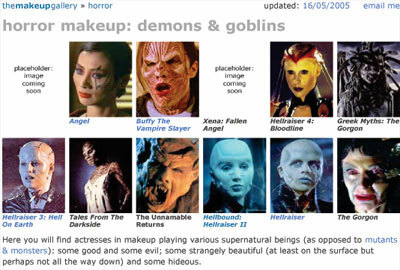 An astonishing web site detailing the processes of make-up application for all types of characters. Click the link to see photos of the Cenobite Reunion at the Weekend of Horrors, Munster, Germany, 2005.